Announcing the 10th annual Smokey Bear Dual Sport Motorcycle Ride. Monday, July 30 - Friday, August 3, 2018. Come spend a week riding your motorcycle in an alpine environment away from the Texas heat. 9th Annual Smokey Bear Dual Sport Motorcycle Ride 2017 - What Happened? I want to invite others to come out and ride for three reasons, (other than to meet new riding friends). 1. The trails need more riding in. If we don't use the trails we risk losing access. 2. More riders over a short period of time will demonstrate the positive economic impact of motorcyclists responsibly using National Forest land. 3. Although there is no cost to participate in the ride I would like to make a group donation to a local Cloudcroft organization or charity to give back and further motorcyclists cause as a responsible user group; organization and amount TBD. Regardless of the local Cloudcroft organization or charity I would like to get a group of riders together for a short ceremony to make the donation at lunch time one day. The ride is based in Cloudcroft, New Mexico. For an idea of the riding available check out the pictures and video from the 2011 Ride Report. For even more trail / forest service road videos click HERE, search New Mexico 400 or Smokey Bear Dual Sport Motorcycle Ride. Invite your family, invite your friends, everyone is welcome and encouraged to attend and ride. You determine when you arrive or depart and your level of participation each day - ride all day, 1/2 a day or not at all. My family plans to ride Monday through Friday. No formal rides, meetings or routes. Just an excuse to ride in the mountains and escape the Texas heat, plus see 3 reasons above. Available terrain ranges from class 1 roads to extreme enduro type trails with astounding variety and options, in fact part of the NMBDR route goes through the area. With riders of different skill levels attending you should be able to ride with someone or a group that fits your ability. I.E. Find the group that is going to ride at the level you want for the day. If you need to warm up (temperature wise) and get tired of aspen and pine trees head west 10 or so miles down the mountain for some desert riding. I will be happy to give route and terrain advice from the areas I've ridden, I still haven't ridden it all in 10 tries, plus a lot of TWTer's have extensive knowledge of the area. Fortunately the detailed Map makes it easy to explore and find your way back. The great thing about riding in the Cloudcroft area is it doesn't take extensive planning just a willingness to explore. I've never used GPS in Cloudcroft, but usually always do in Texas. Why? There are so many options. I usually just head out of town each day in a different direction from the day before and let the ride flow. See a legal road or trail, check it out. Signage has improved in the area but not perfect, which in doubt check the Map. At an intersection we go the way that looks the most fun and where the sky is lighter. Most days there will be a shower somewhere in the forest, usually easily avoided by watching the sky, that also keeps the dust down or eliminates it completely. If a road or trail is too wet, like the three bears you can usually find one that is just right. Then at 3 or 4p in the afternoon wherever we are in the forest we find our location or the MVUM Map and connect the best route back to Cloudcroft. My family will be on plated dirt bikes but there are plenty of forest service and logging roads for heavier dual sports and adventure bikes. The days my wife rides we stick mostly to gravel forest service roads and logging roads as most of the single-track trails are very technical. I try to get in at least one full day on the Rim Trail and other single-track trails. My wife and I plan to arrive on Saturday night to get situated on Sunday, scouting, getting last minutes items, and maybe even riding a little. Up in the clouds, at nearly 9,000, feet, Cloudcroft offers heavenly lodging options. Stay in a romantic cabin nestled in the pines or a Victorian retreat in the heart of the village. Click here - To find convenient lodges, hotels, condos, townhouses, camping areas and more. We stay at the Spruce Cabins, there are lots of cabins in town and several motels. The Spruce Cabins offers a 10% motorcycle discount but you have to ask for it to receive it. If you stay 6 nights at the Spruce Cabins, the 7th night is free, since we already booked 6 nights we are going to arrive a day early and take advantage of the extra night. The unofficial banquet will be Friday, August 3th at Ski Cloudcroft. Unofficial meaning, no host, show up if you want, when you want, of course during their business hours. My group will probably get there between 630 & 7p. http://skicloudcroft.net/ - "The restaurant is also open for the summer, Friday 4-8 PM, Saturday 12-8 PM, and Sunday 12-7 PM. Get out of the heat and enjoy one of our famous pizzas on the deck and cool summer air." A MVUM map with trail ratings highlighted, marked easy, moderate, and difficult as per the rating spreadsheet, prepared by the TrailBoss. High Altitude on Burro street also sells the forest service map, and a topo map. Click on High Altitude more more info and an interactive topo map. Alamogordo is 16 miles to the west (about 4500 feet lower in elevation) has the major chain stores and several motorcycle shops. * up at 9,000 elevation. * 40 miles from casino wagering and golf at the Inn of the Mountain Gods. * 50 miles from Ruidoso Downs. * 16 miles from the Space Museum, Alameda Park Zoo, and Toy Train Depot in Alamogordo. * 40 miles from White Sands National Monument. * 150 miles from Carlsbad Caverns. * 90 miles from El Paso and the Mexican border. * Within 50 miles of 8 magnificent golf courses. Why is the ride named after Smokey Bear? In 1950 a real baby bear became the live "Smokey” when he was rescued from certain death by firefighters in a devastating blaze in New Mexico's Lincoln National Forest. This looks like the perfect Summer ride. My son and I are tentatively in. Will just have to see how the Summer schedule shakes out. Wife may come and bring her Tdub as well. Thanks for organizing. Can you get away without re-jetting or will the bikes run like crap? Coming from the Austin area. For my XR400R with a pumper carb I usually drop 2 sizes on the main, I also went 1 size smaller on the pilot this year. I was a little lean, I'll probably just drop one size on the main only next year. 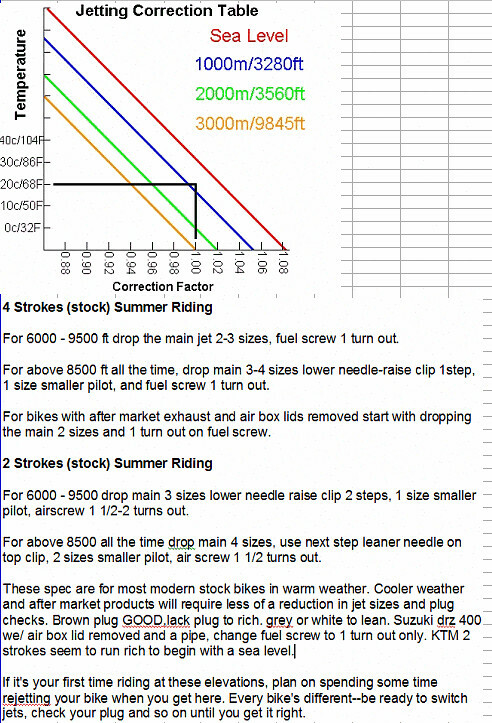 On my wife's TTR125L I just drop one size on the main with the stock pilot jet. To keep Murphy at bay I take extra jets on each side to be safe. Some guys I ride with on WR450s don't rejet and get away with it. Of course every bike is different, sometimes even the same make and model, and mods. I found this info online. Thanks for the advice. This is very helpful. I didn't put you thru enough ? I hope to make it also. I used to have a place in weed, and still have friends there. I’ve been riding up there since 09 and it’s my favorite place to ride. Endless dirt roads and no traffic. You can ride all day and see very little people. At any time you can pull and hike into the woods and be the only person for miles. There’s lots of Elk too if you know where to look. I’ll definitely try to make this ride, it will be nice to ride with a group up there. A few of the elk in the herd that crossed Alamo Peak road this afternoon. A few from a scouting trip from Feb 11 & 12 2018. We went up to ski, we knew that was out before we went and discussed taking bikes. The ice rink was only open one night due to the warmer weather. Anything south facing was clear of snow and dry. It was cool, but I still could have worked up a sweat on the single track. I did this ride last year and had the time of my life. I rode my little wr250r all the way from San Antonio to cloudcroft in just 11 hours with 11 fuel stops (no extra gas, was on fumes many times) and tent camped. Can't wait to do it this year but I'm probably going to rent a trailer this time! It was a great time last year i hope to do it again this year. Hmmm, sounds like fun... I've got some planning to do! Hope I'll get a chance to ride with y'all this year. I'm in TX this week closing on a farm near Athens. Those pictures are already making me home sick! I love telling your story -AMAZING!!! I live in Athens. Me and a friend from Athens are going on this ride. We've both rode up there before. We should meet up and ride some of the FM roads sometime after you close. I'm not a fan of Hwy riding but there are plenty on FM's and black tops around Athens. Look forward to it. I'm hoping the dirt roads in east TX will eventually dry out after all this rain! Anyway I have little desire to ride my wr250r another 1300 miles there and back. I'm torn with 2 options. I can rent a trailer and maybe a couple others I could bring along to help split gas, etc. Or if anyone is going and has a spot for me and the bike I would be grateful and help out with the cost. Either option let me know if it's something you are interested in. We did some scouting on the southern part of the Lincoln National Forest, the Guadalupe District. Lots of variety. Just booked my cabin for the week! I am going to make this, but I would like to find something a bit, how shall I say, nicer to stay in. I have been to the hotel once and the cabins once, are there many other choices?